In August 2002 I took a trip up the James Bay Road with Julie. 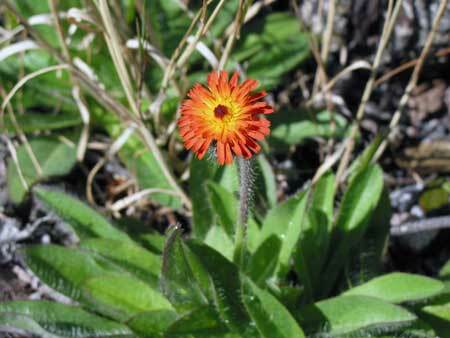 I was looking forward to taking lots of photographs with my digital camera (Canon Powershot G2). But the camera broke the second day on the Road!! :( And I hadn't brought a backup camera. We had a wonderful trip in spite of this (of course). So, here are a few photos that I did manage to take on that trip. 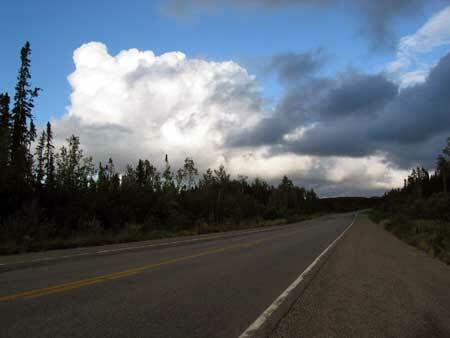 Km 44: It had been raining, but cleared off in the early evening. Spectacular clouds! We stopped at the campsite at Olga Lake. The sunset was awesome! 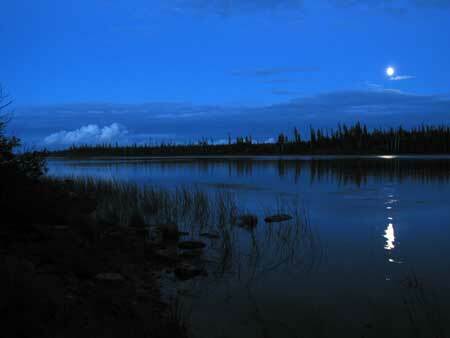 Then the full moon rose over the calm lake! 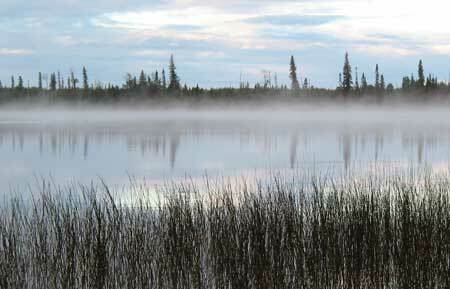 The next morning there was mist on the lake. We headed north, stopping at Km 70 to look around. There's a nice view west of a river here. And this is the last picture that camera took! 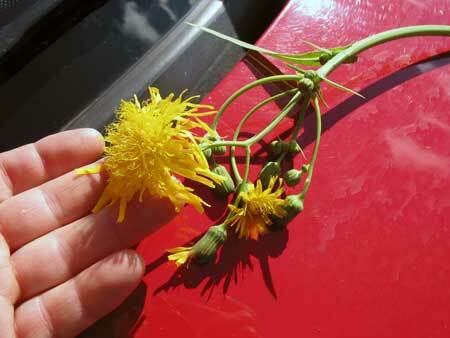 Common Sow Thistle. We continued north to the Broadback River at Km 232. We met a couple of guys there whose truck wouldn't start. Bad place for a breakdown! We drove them to an emergency phone and back, then continued on our way. Of course we stopped at the Rupert River (Km 257). A forest fire earlier this summer has burned the forest all along the north shore of the river. We hiked along the trail, exploring and experiencing the powerful rapids. 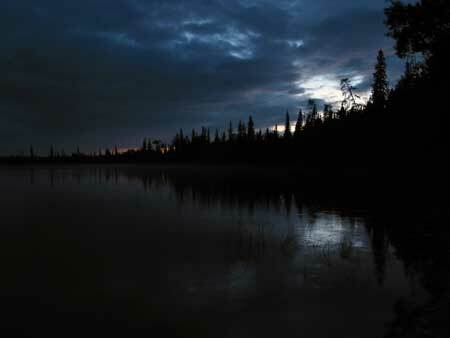 That night we camped at Willow Lake (Km 375). That night the Northern Lights came out in full force - spectacular display of curtains and streamers. Towards dawn some thunderstorms came in from the west. I watched them closely, as we were in our tent in an exposed area. But the storms seemed to part and go around us, so I went back to sleep. We continued north the next day, stopping here and there to sightsee. Drove out to Chisasibi to see the James Bay. For some reason this seems like a powerful place. We went back to Radisson for the night, checking into a motel due to the large numbers of black flies. The next day we went on a tour of the dam and hydro-electric facilities - English-speaking tours are available on request. 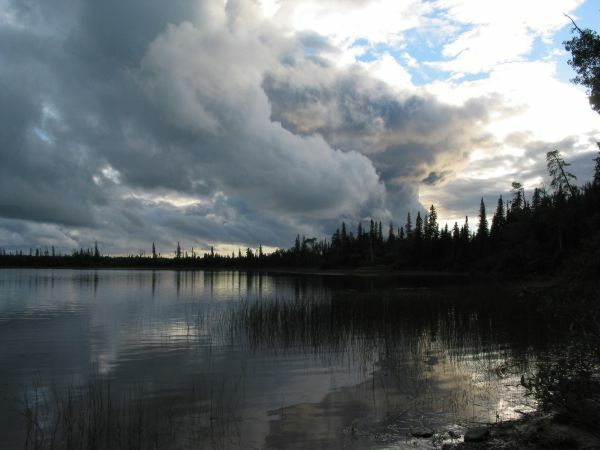 Then we headed back south, Camped at Mirabelli Lake. Nice view overlooking the lake, and we watched the full moon rise over it. Continued south the next day, stopping at the Rupert and Broadback Rivers. We tried driving to Waskaganish just to see what was there, but we turned around when the road got too rough -- could only crawl along. We decided it wasn't worth it and turned back. 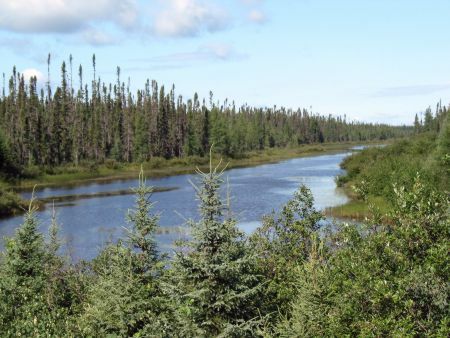 When we got to Matagami, we decided to try going along bush roads R1005 & R1000 to Lebel-sur-Quevillon. Rough roads, and some tricky navigation, but we made it ok.
We finished our trip by driving down through Quebec and crossing into Ontario over the Ottawa River near Ottawa.